If you have ever asked yourself, how can I create powerful, easy to understand work instructions from a 3D CAD model, we have the solution for you. The XVL Work Instruction Suite is the total solution to create detailed, step-by-step work instructions. A single work instruction may have multiple processes and each process may have multiple tasks. In addition, this suite includes all of the functionality of the XVL Technical Illustration Suite for creating 2D illustrations. Like all solutions from Lattice Technology, the XVL Work Instruction Suite is designed for non-technical users with no CAD experience. Assembly Process Planning. Includes tools, fixtures, equipment and people. Customer Self-Service. From assembly to service instructions. Service Procedures. Delivered in 2D or interactive 3D on devices such as an iPad. Shop Floor Assembly. Clear procedures delivered to the shop floor that are current. Ease-of-Use. 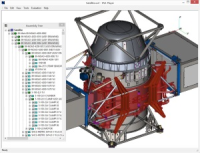 No CAD experience is required - use tools like “drag and drop” and Lattice Technology’s easy-to-use editor. Increase Efficiency & Quality. Clearly documented work instructions will increase productivity, quality and job satisfaction. Save time and increase accuracy. Leverage and re-use geometry directly into your work instructions and technical documentation. Stop creating manual drawings. Click here for the supported CAD formats. Synchronized Updates. Engineering changes happen. During the update review process, any change will be highlighted allowing the user to control updates to the downstream documentation. 3D Capabilities. Interactive cross-section, measure, collision/interference, draft-angle. Animations. Easily create powerful animations that can be consumed for FREE by others using tools such as Microsoft Excel, 3D PDF and interactive web pages. Authoring. Automatic trace lines, notes, labels and dimensions. Automation. Much of the process for generating technical illustrations is automated allowing for manual intervention. Interactive Instructions. Detailed, step-by-step instructions, with alerts and warnings and animations. mBOM and sBOMs. Multiple manufacturing and service BOMs may be created using the single engineering BOM. Alternatively BOMS maybe be imported from systems such as ERP or MES. Output Formats. Publish in a variety of formats including raster (JPEG, PNG, TIFF, BMP), vector (SVG, CGM, EPS, DXF), or interactive 3D (click here for more information). Plus all the features of the XVL Technical Illustration Suite for creating 2D technical illustrations.